Sometimes considered the crossroads of the Middle East, Jordan is a small country, but one that’s awash with history and culture. 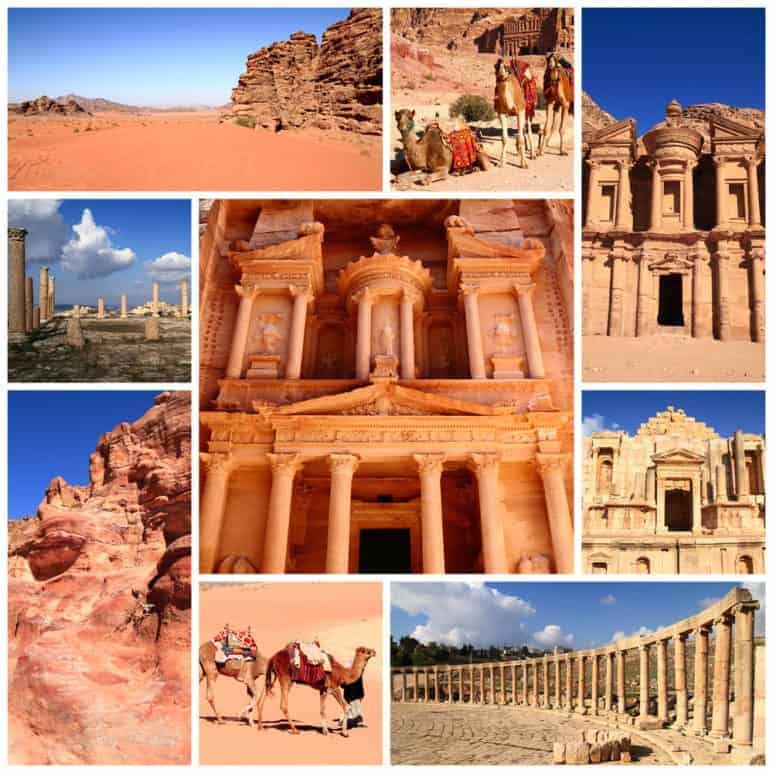 Jordan boasts desert canyons, ancient temples, the world-renowned Petra and striking Wadi Rum. It’s a country where guests engage with the Bedouin community, eat fantastic food, and float in the mesmerizing waters of the Dead Sea. Jordan is a destination for adventure, authentic experiences and unique encounters. 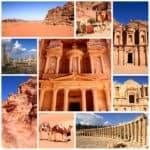 While there’s so much packed into this tiny nation, these must-visit attractions should crown your list of places to see in Jordan. Often, Jordan luxury tours begin and end in Amman. Most of the country’s flights arrive and depart from Queen Alia International Airport, so you’ll want to spend a day or two exploring this multicultural, cosmopolitan city. Situated in the northern area of the country between the desert and Jordan Valley, Amman traces back to as early as the 13th Century BC, but today’s city is one in which old merges with new. 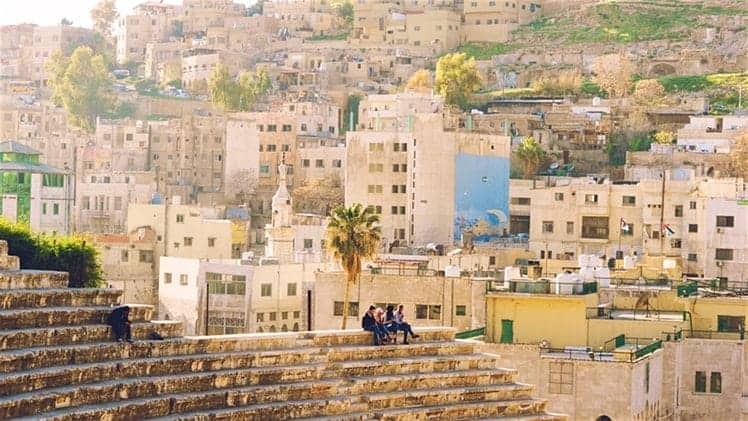 Known well for its friendliness and hospitality, Amman welcomes visitors from around the globe with open arms, and locals proudly showcase and share the cultural offerings of their hometown. There’s a bevy of places to visit here, be it beautiful mosques, incredible Roman ruins, or bustling souks, as well as independently-owned shops, restaurants and cafés. Wander through downtown and taste the myriad flavors of Amman. Centrally located in downtown, the towering Citadel sits high on Jebel Al Q’ala’ – a hill resting 850 meters above sea level – one of the seven original mountains of Amman. 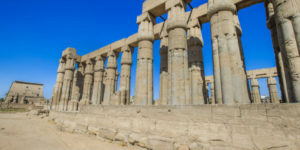 The most compelling component here is the Temple of Hercules, which houses pieces of Roman civilization including a statue remnant of the Roman hero’s hand. Dating to the 8th century, Umayyad Palace consists of fragmented buildings, arches and columns, hailing from the Byzantine Empire. The rose-red city is one of the most well-known archaeological sites on the planet and a must-visit place in Jordan. “Petra,” which translates to “Rock” in Greek, was formed some 2,000 years ago as the capital city of the Nabataean Kingdom. 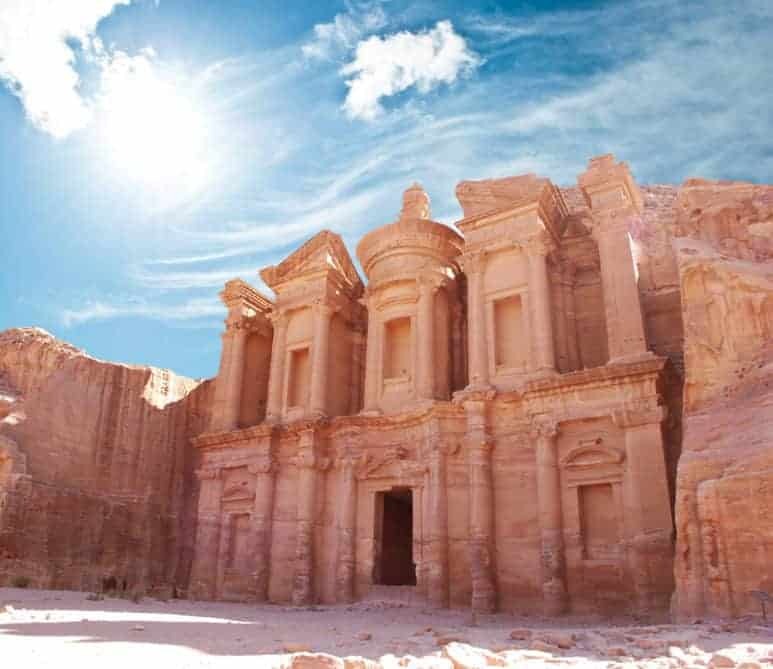 It’s a mélange of tombs, temples and obelisks, and a wealth of treasures waiting to be uncovered (85 percent of Petra has not yet been revealed). 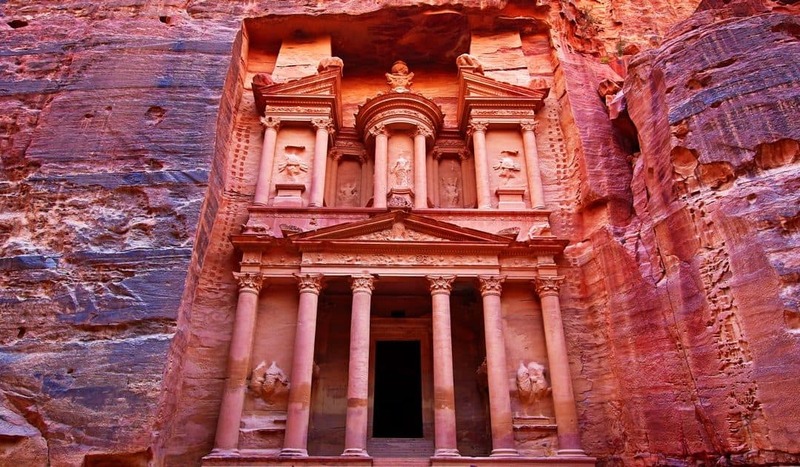 Located about 150 miles south of Amman and 75 miles north of Aqaba, Petra spans 23 square miles. 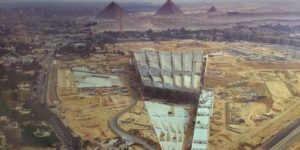 It was selected as one of the New Seven Wonders of the World and has been a UNESCO World Heritage Site since 1985. Enter Petra through the Siq, a narrow rocky path flanked by cliffs and stretching for less than one mile. The journey takes at least 45 minutes to an hour to travel on foot, depending on speed. At the end lies the Treasury or Khazneh, a carved ceremonial tomb, also the most photographed site in Petra and the setting where Indiana Jones hunted the Holy Grail in the film, Indian Jones and the Last Crusade. While the Treasury is often considered the most majestic aspect of Petra, it’s by no means all there is to experience. 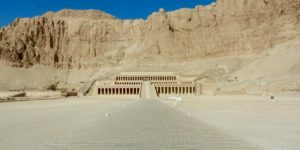 You’ll need at least one full day, perhaps two to explore the other sites including the Outer Siq, the High Place of Sacrifice and the Tombs of Wadi Farasa, the Byzantine church, a 7,000-seat Roman theater, the Royal Tombs, and the Petra Museum. 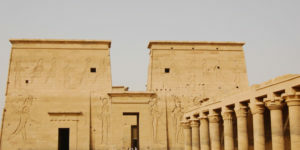 Many Egypt and Jordan tour packages include a visit to Petra. 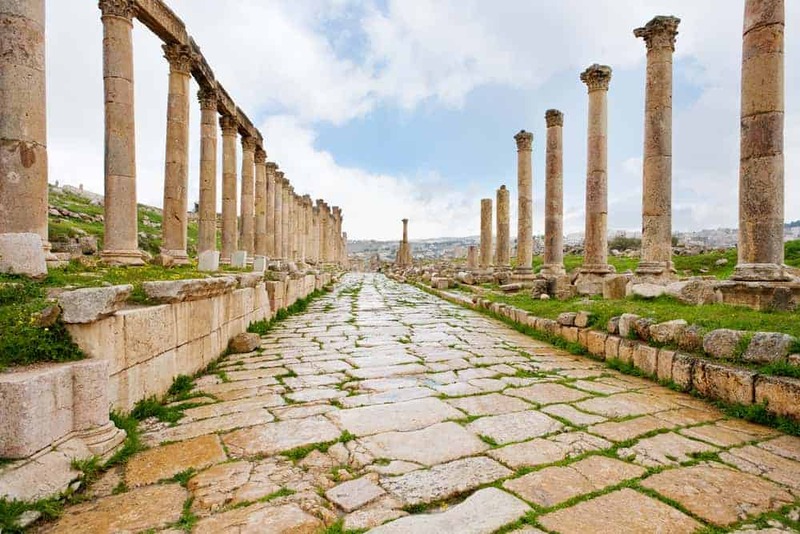 About a 50-minute car ride from Amman, this town of ruins is one of the most well-preserved Roman sites outside of Italy. 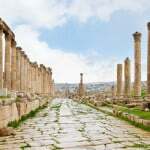 Jerash often lands in second place, only to Petra, for the must-visit sight in Jordan. Romans ruled Jerash (known as Gerasa) during the Golden Age, and the city has been excavated and refurbished over the past 70 years. It’s a trove of ancient theaters, temples, colonnaded streets, public plazas and fountains. Major points of interest include the stunning Hadrian’s Arch, constructed in AD129; the Hippodrome – where chariot races for up to 15,000 spectators took place; the South Gate, one of the original four gates dating to AD123; the Temple of Zeus, worth the trek for the awe-inspiring views, and the Cardo Maximus, which is the city’s main colonnaded street, accented with the partially preserved nymphaeum – the primary fountain in Jerash. 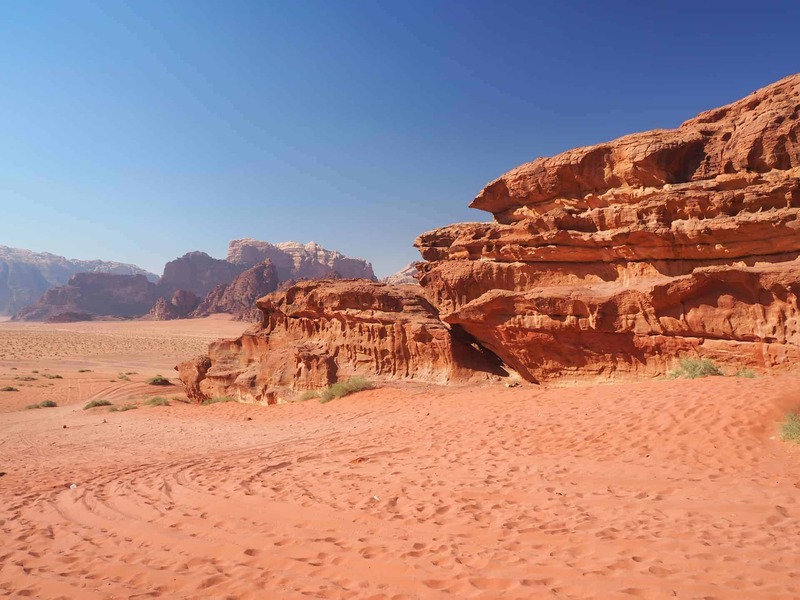 Translated to “sand valley,” Wadi Rum is a protected desert area in southern Jordan, teeming with sandstone mountains, bouldered chambers and soaring canyons. Experience this magnificent wonder by camel, horse, jeep, or on foot. If you’re traveling on your own, with a guide, or on a private Jordan tour, all tours of Wadi Rum begin at the visitor’s center. Tourists can spend anywhere from a few hours to a week or more exploring this pocket of Jordan. Those who live for adventure will find plenty of it in Wadi Rum. 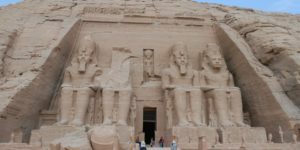 Rock climbing, hiking and trekking through the desert as well as safari by camel or jeep provide thrill-seekers several choices for an exciting holiday. Also referred to as “Valley of the Moon,” Wadi Rum remains home to Bedouins. While most of the Bedouin community have abandoned the nomadic lifestyle and live in the villages now, they still rely on livestock for milk, yogurt and meat. Many of the Bedouins have dedicated their time and energy to developing Wadi Rum as the renowned tourist destination that it’s become. Since there are no hotels in Wadi Rum, camping or bed and breakfasts are the lodging options. Imagine sleeping in the midst of the Jordan desert landscape under a starry sky? For nature enthusiasts, go for wild camping with minimal amenities; for more civilized accommodations, stay in a luxury Bedouin campsite with showers, toilets, and eateries nearby. If sleeping in the great outdoors is out of the question, you’ll find hotels in Aqaba and Petra, both about 90 minutes from Wadi Rum. Follow in the footsteps of Cleopatra and King Herod when you soak up magnesium, potassium, bromine and more than 30 other minerals in the warm, healing waters of the Dead Sea. Situated west of Jordan and east of Israel and Palestine, this salt lake at 408 meters below sea level – the lowest point on the face of the earth – attracts visitors from all over the world for its serene and spiritual properties. A natural wonder, this peaceful body of water expels a spa-like feel and provides mineral-rich mud that’s excellent for the skin. Because of the high salt content, the waters are buoyant, and floating takes little effort. Coat your skin with mud, bask in the sun, then rinse and relax in the Dead Sea.